I’ve spent a lot of time in Oregon in the last year or so — there is a whole chapter in my soon to be released book Extreme Wine about the extreme wine people I met at last year’s International Pinot Noir Celebration. But Oregon has a lot of extreme wines and extreme wine people with stories that deserve to be told. Herewith a very brief survey of some of the Oregon extreme wines and people that we’ve encountered in the past few months. Lonnie Wright is one of the key figures in the Columbia Gorge AVA that spans the Washington-Oregon border along the Columbia River. He has been instrumental in the development of the vineyards in this region. I am not sure where this part of the Oregon wine scene would be today without Lonnie’s wine-growing and vineyard management expertise. Lonnie appears in this column not because of a vineyard he planted, however, but because of one he brought back to life: a vineyard of 100+ year old Zinfandel vines that produce a special wine for his The Pines 1852 label. The story is that stone mason Louis Comini came from Genoa to help build the locks on the Columbia River. He stayed in The Dalles when the job was done, helping out at the local Catholic church. The vineyard, planted in the late 1800s, was his work. I thought I knew what an Old Vine Zin vineyard looked like from my visits to Sonoma, but this one bears no resemblance to the gnarled vines I saw there. It gets cold in this part of Oregon and in the old days the vines were cut off at the ground so that they’d be protected from freezing temperatures by a blanket of snow. The roots are ancient and gnarly, but the vines not so much as you can see in this photo and in the video above. Lonnie found this vineyard and recognized its potential. The old vines and the wines that come from them are a tribute to his extreme persistence and sense of history. Phelps Creek Vineyard is also in the Columbia Gorge AVA, a short drive from Lonnie’s old vines, but a world apart. Bob Morus began this extreme project in 1990 when the first blocks of Dijon clone Pinot Noir were planted (Lonnie helped lay out the vineyard, Bob tells me). The slopes are steep, the aspect dramatic and the view of Mount Hood is spectacular. Bob has a pretty extreme view of what his vineyard and winery can accomplish — and ambition to make wines that can not just stand up to the Willamette Valley wines that get all the attention, but to Burgundy, too. He was able to entice Alexandrine Roy of the famous Burgundian wine-making family to become involved with the winery, eventually becoming Director of Winemaking. Bob generously met with us twice this year, first in March when we tasted a vertical of the Estate Reserve Chardonnay and then again in July, when we sampled a vertical of the Cuvee Alexandrine Pinot Noir at the winery overlooking the vineyards. The wines were elegant and Burgundian in their ability to capture both place and vintage. Really delicious and a great reminder that extreme Oregon Pinot extends beyond the Willamette Valley. 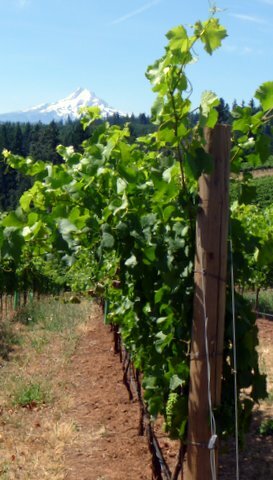 King Estate Winery is Oregon’s largest wine producer, but its estate vineyards lie just south of the the Willamette Valley AVA line, so most of its wines carry the more general “Oregon” appellation. King Estate has four main wine lines, the flagship King Estate Domaine wines made exclusively from estate fruit, the Signature wines that add purchased grapes to the mix, the wildly popular Acrobat wines and a line called NxNW made from Columbia Valley fruit. Pinto Gris is the top seller and the winery’s flagship wine. Wine club members have access to special bottlings and single vineyard wines. The beautiful hilltop winery is bursting at the seams with activity. We met with executive VP Steve Thomson to talk about King Estate’s marketing program (and especially its recent move into the Chinese market) and its plans for the future. Elizabeth Allcott introduced us to wine club members at a wine pick-up party that was going on during our visit. And we enjoyed talking both wine and wine economics with assistant winemaker Derrick Thoma (both of Derrick’s parents are economics professors — his father Mark is the guy behind the influential Economist’s View blog). King Estate is large by Oregon standards, but not a megawinery by any means. It is extreme in many ways, but perhaps most notable for its commitment to sustainability, which seems very deep, and its focus on hospitality. We perceived a strong sense of identity and purpose, but also a dynamic feeling appropriate to a rapidly evolving wine region. The winery experience is very well designed and the opportunity to taste estate wines along with locally-sourced food products (many from the estate itself) at the well-regarded winery restaurant is a treat. We will remember for a long time the dinner we enjoyed on the deck overlooking the vineyards with a bottle of 2002 King Estate Domaine Pinot Noir. We were in Southern Oregon recently — I spoke at a regional wine industry symposium and we attended an event called World of Wine Festival, the premise of which is that you can find a world of wine in this part of the state. And you can! It was great to meet everyone and taste the wines. We found time to visit two wineries that showed two very different wine extremes. Bill and Barbara Steele were not looking to make wine when they bought a big plot of land in the Applegate Valley. They wanted to pursue their passion for sustainable agriculture and sought out farmland that had been abandoned for many years. Once they found their dream farm, they let the land speak to them (not literally — they did a lot of scientific testing) and what it told them was that it wanted to be a vineyard and farm, with Rhone grape varieties covering most of the territory (distributed according to soil types and heat unit measurements) with a fallow pasture, some vegetable gardens and a stand of hazelnut trees. And, of course, a winery called Cowhorn Vineyard and Garden. 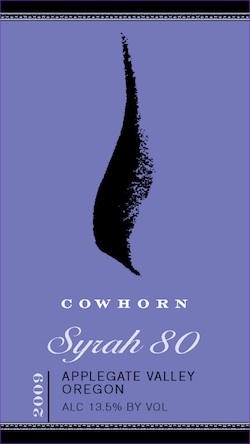 Cowhorn might be the only biodynamic vineyard in Southern Oregon (biodynamics is much more common up north) and it could be the largest integrated (grapes plus other agricultural produce) biodynamic farm in the U.S. (Click here to see the master plan of the estate.) Ironically, biodynamics is notable in grape farming, which movement founder Rudolf Steiner did not specifically address, than in the broader farming community that he intended to influence). It was great to see the Steele’s bush Grenache vines and to learn about their passionate attachment to their land and commitment to sustainability and natural winemaking generally. Oh, and the wines are extremely delicious. Just down the road from Cowhorn we came to Valley View Winery and it provides this column’s final extreme. Mark and Michael Wisnovsky’s family are the second generation to farm this land and they seem to have a special relationship with it. They take care of the land and the land takes care of the family. Wine entered the mix in 1972 when their father planted vines and started the first winery in these parts since prohibition. Modern pioneers! They named it Valley View after a winery that was established by pioneer Peter Britt back in the 1850. Valley View has one foot in the past — we brought home several bottles of a delicious 30th anniversary Pioneer Label 2005 Merlot with a label as close as government regulations allow to the earlier wines. But the other foot’s in the future. Mark showed us a line of wine called Rogue Red that has proved popular in Oregon (he does bottle signings at Costco) and will soon show up in Washington and other states. It’s larger volume than the other wines and aimed at the growing market for red blends. Our friend Charles walked out with a case of Rogue Red. Mark said that he would love it if everything happened right there on the farm — the grapes, the wine, the tasting room, all right there in Applegate Valley. But Mark and family recognized the need to look outward (even to Costco) to seize market opportunities while still respecting their history and the region’s heritage. Rogue Red is successful part of that extreme wine balancing act. Thanks to everyone who made these visits so interesting: Lonnie and Sierra, Bob and Becky, all the folks at King Estate, Bill and Barb, Mark, Chris and Allison. Special thanks to research assistants Bonnie and Richard. There’s a section in Extreme Wine, my new book that’s due out in October, that examines the Invisible Wine phenomenon. Invisible Wines? Not invisible in the sense that they can’t be seen with the naked eye, but invisible as in extremely overlooked. They’re right in front of you, big as life, but somehow they just don’t show up on the radar. The Yakima Valley is Washington State’s invisible vineyard. 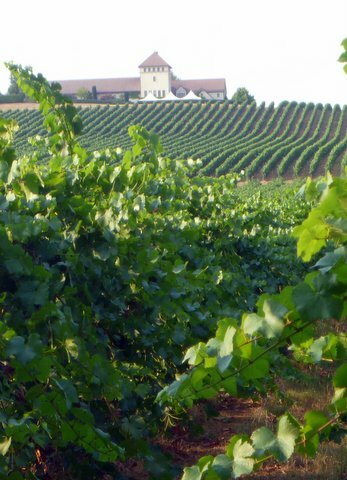 It is the state’s oldest AVA (celebrating its 30th birthday this year), it has the largest vineyard area and is the chosen source of raw materials for many of Washington’s most celebrated wines. And yet if you ask people outside the region (and some locals, too) about Yakima wine you can get a blank stare. The most famous Yakima probably has nothing whatsoever to do with wine — Yakima Canutt, the celebrated Hollywood stunt man — you saw him in Stagecoach and Ben Hur and dozens of other films– check out the highlights video above. Sue and I have spent a good deal of time in the last year learning about Yakima wine. I walked the DuBrul Vineyard with Kathy, Kerry and Hugh Shiels last July and then returned with Sue and a crack research team (Richard and Bonnie) to get to know the Red Mountain AVA in October. 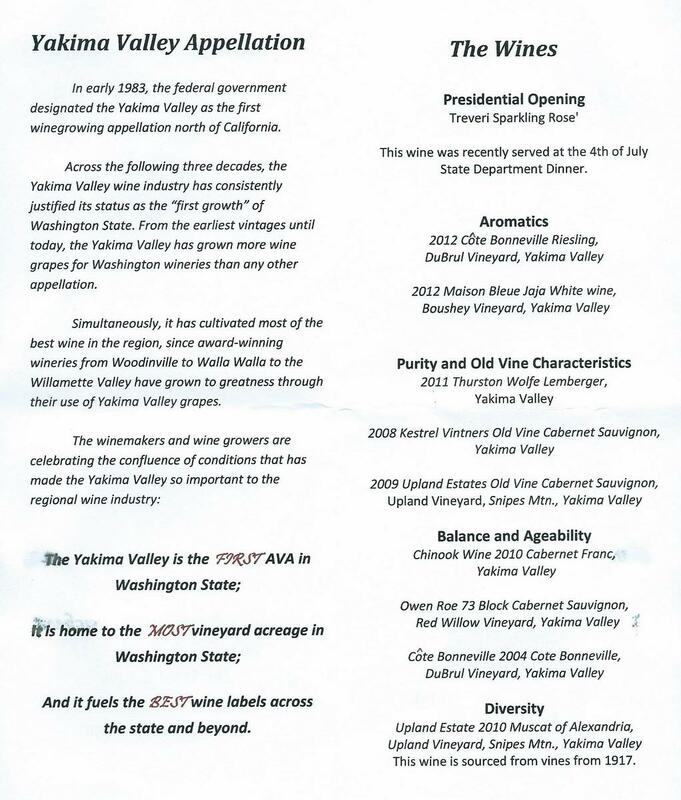 We attended seminars that highlighted two sides of Yakima Valley’s story at Taste Washington in March. And then just recently we were invited a special tasting of Yakama AVA wines in Seattle that featured presentations about the region’s special winegrowing advantages, particularly the long growing season, the long days of sunlight during that season, the advantageous aspects (south-facing slopes) and the soil profiles that have resulted from complex geological combinations of volcanic eruptions, the Missoula flood and more. It was a very useful seminar. I’ll paste the tasting menu at the end of the post so that you can get a sense of how diverse the wines from this region really are. Winegrowing in the Yakima Valley is much older than the AVA’s 30 years. The first wine grapes were planted in 1869 by a Frenchman named Charles Schanno but the real beginning was just a little over 100 years ago when Willliam B. Bridgman laid down vineyards. Todd Newhouse of Upland Estates makes a tiny amount of ice wine from some of the Muscat vines that Bridgman planted in 1917. Tasting this wine is like sipping history — a pleasure on many levels. So why is the Yakima Valley invisible or at least less well-known than you’d expect based on the quality (and quantity) of the wines made from its fruit. There is no single answer, but the amenities gap is the most commonly cited concern. Everyone moans that the Yakima Valley needs more upscale hotels, resorts and eateries and I suppose this is true, but there is a circular reasoning problem. You won’t get the investment until a critical mass of visitors appears and you won’t get the visitors until the amenities are there for them. Someone has to break the cycle and while the new Walter Clore Wine & Culinary Center is a welcome addition it isn’t enough by itself. Fortunately I’ve heard rumors of possible new initiatives that might jump start the development process. Fingers crossed. But I don’t really think that the amenities gap is the real problem and while I would certainly welcome more lodging and dining choices in the Yakima Valley, I don’t this this alone will transforms the region’s reputation. There are other factors that are more important and they make me wonder how concerned we should be about Yakima’s invisibility. Come back next week for my analysis. OK, maybe film stunt men like Yakima Canutt are invisible too — you see their work, but never know who they are. 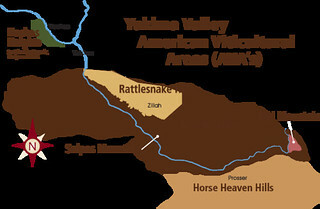 I guess that might make the two Yakimas (the valley and the cowboy) very much alike. Hope you enjoy the video. Thanks to the Barbara Glover and Wine Yakima Valley for inviting us to a tasting of Yakima Valley wines at Wild Ginger in Seattle (if I was trying to make you jealous I would tell you about how well the 2004 Cóte Bonneville tasted with Wild Ginger’s Fragrant Duck). Special thanks to Wade Wolfe and Kerry Shiels for sharing their knowledge of the valley with us. The conventional wisdom disagrees, but I say what’s wrong with judging a book by its cover? People judge wines by their labels all the time! OK, so maybe it is a bad idea as a general rule, but I encourage you to make an exception for my next book, Extreme Wine, which is sailing smoothly towards its October 2013 release date. Check out the recently-finalized cover– pretty cool, huh? Hope readers will think that the book is as good as the cover that embraces it! Best Sellers Are Made Not Born? Since Wines Wars was such a success, we naturally have high hopes for Extreme Wine. Wine Wars in its three editions (hardcover, paperback and eBook) has consistently appeared in Amazon.com’s various specialized best seller lists (such as the top 100 globalization books, for example), but didn’t bust through to the really big New York Times kind of league tables. Tough to break into the really big leagues, I guess. In reading about how the best seller lists work, I discovered that there are some techniques to “game” the best-seller rating system. Some unscrupulous authors and publishers, for example, have apparently purchased large volumes of their own books all at once — creating the sort of sales bump that pushes a book onto the big time lists — only to cancel the order or return the books after ratings have appeared. Mission accomplished, so to speak, and a phantom best-seller created. Clever, I suppose. But not very ethical. I would never do anything like that (even if my credit card had enough head room to allow me to place such a big order). But there’s another technique that is also strategic but not entirely unethical. It involves Amazon.com pre-orders. Apparently all of the pre-orders on Amazon are processed together on the day that a book is released — giving that same sales bump as the phantom strategy, but based upon actual orders, not fake ones. I guess that’s why some of my author friends encourage their readers to pre-order. I wonder if it would work for Extreme Wine? If you’d like to participate in an experiment to find out, click here to visit the Amazon.com page for Extreme Wine where you can pre-order the hardback (you’ll have to wait for the Kindle version). It’s just a social media experiment, you see, not really Shameless Self-Promotion as you are probably thinking! Savour Australia 2013: Australia’s Global Wine Forum from Wine Australia on Vimeo. Speaking of Shameless Self Promotion, I’d like to announce that I’ve been invited to speak at Savour Australia 2013, Australia’s first global wine gathering, which will happen in Adelaide in mid-September. You can learn about Savour Australia 2013 by clicking here or watching the video above. The purpose of the program, as I understand it, is to re-launch Brand Australia onto the global wine markets — to replace the down-market Yellow Tail sort of image that evolved over the last dozen years with an up-beat, up-market narrative that connects Australian wine with its regions, food, culture, people, and links it all to wine tourism, which is the best way to have the complete experience. I think the message is exactly the right one for Australia today and I am looking forward to being part in the discussion. Here is Your Chance to Tell Me Where to Go! Sue and I will be staying in Australia for a couple of weeks after Savour Australia 2013. Where should go and who should we visit? If you have suggestions please leave a comment below or email us at Mike@WineEconomist.com. Looking forward to seeing you at Savour Australia 2013! When I started working on my book on Extreme Wine (due out in the fall) I asked Wine Economist readers for ideas. Who are the most extreme wine people, for example? I received many nominations but one particularly caught my attention. It came from a California winegrower who asked that winegrowers (although not him/herself) be included on the list. Everyone says that wine is made in the vineyard — and some growers go to real extremes to make that happen — but it is the wine makers who get all the attention. 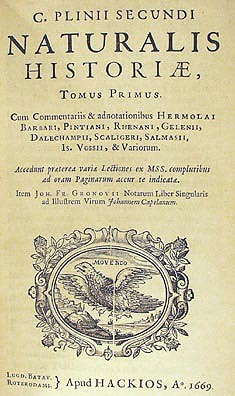 The Pisoni family was cited as an example. Fruit from Pisoni Vineyards goes into some of the best wine in California, although only a little of it is bottled under the Pisoni name. Good point. A quick search on Robert Parker’s website turned up a long list of Pinot Noir and Syrah with the Pisoni Vineyards designation (Parker calls it a grand cru vineyard in one review). The 2008 Pisoni Estate Pinot earned the highest score (98/100), but all the reviews were strong. Clearly there’s something special about this vineyard and the people who farm it. I visited several extreme winegrowers in 2012 (most recently on Red Mountain). Here are three that illustrate different sides of the extreme winegrower phenomenon. As luck would have it, at about the same time I was having this extreme wine people conversation I received an invitation from Wine Yakima Valley to participate in a program they were organizing to help wine enthusiasts get to know several of the most noteworthy (read “extreme”) vineyards in the Yakima Valley AVA (which celebrates its 30th birthday in 2013). A perfect opportunity for me to do some extreme vineyard / wine grower research! The Vineyard Tour Series highlighted the work of four outstanding growers at Red Willow Vineyard, DuBrul Vineyard, Upland Estates and Boushey Vineyards. What a great opportunity. Each of these vineyards is famous for the quality of the wines made from its fruit and each is discussed in Paul Gregutt’s valuable book, Washington Wines & Wineries: The Essential Guide. Gregutt knowingly breaks down Washington wine into grapes, AVAs, wine makers and wine growers. Boushey is one of his “grand cru” designates while Red Willow and DuBrul make “premier cru” in the top 20 list. All these vineyards have interesting stories, but the DuBrul program was the best fit for my schedule. Our DuBrul Vineyard is situated on a basalt promontory with sweeping vistas in all directions. The steep rocky south facing slope is composed of dissected terraces comprised of coalesced alluvial fan deposits primarily from the Ellensburg Formation. The soils in the vineyard are made up of relatively thin loess (wind-deposited silt) over the more coarse-grained alluvial fan deposits. The volcanic ash and heterogeneity of the rock types within the Ellensburg Formation add to the complexity of our terroir. It’s hard land — literally. I think I remember Hugh saying that the spacing of the vines was partly determined by the lay out of the previous apple orchard there. The land was too equipment-busting tough to cultivate any other way, so they were forced to accept what they had to a certain extent. Wade Wolfe laid out the vineyard and Stan Clarke advised on the winegrowing — that’s as good a combination as you can get in Washington State. The grapes are in high demand and are sold to only a few carefully selected customers — if you see the DuBrul Vineyard designation on a wine label you can expect something pretty special. So special that some of it is reserved for Cote Bonneville, the estate wine that Kerry makes. The wines get high marks from the critics. At $200 the top of the line Cote Bonneville Du Brul Cabernet Sauvignon is the most expensive Washington State wine. But DuBrul Vineyard isn’t about the money, it’s about the place and the particular geological forces that shaped it over the millenia and that shape what’s in your wine glass today. And, of course, it’s about the extreme wine people who have nurtured it. The first thing you see when you approach Larkmead Vineyards, which is located in Napa Valley up the road near St. Helena, are the 120 year old head-trained Tocai Friuliano vines planted in a block between a house and the road. 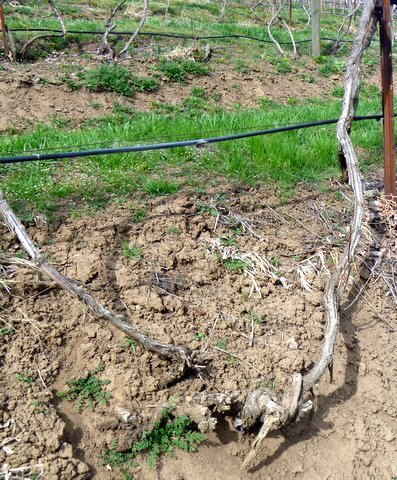 Man, that’s history, I thought, as I surveyed these gnarly old vines and imagined the tenacity of the owner and the commitment to a less-than-fashionable Napa Valley variety. I was right about the history, but wrong about the commitment to Tocai. Turns out the Tocai vines were kept through the years in spite of negligible market demand because they made such a darn fine hedge in the summer. Completely blocked out the road and its noise! Only in recent years did the winemaker decide to make lemonade out of the lemons. Now the unusual wine quickly sells out its tiny production each year. (I was too late to try the most recent vintage. Sigh … maybe next year). We came to Larkmead for the history (although not specifically for the Tocai Friuliano). Larkmead got into my head when I first read Jim Lapsley’s history of Napa Valley wine, Bottled Poerty. The legendary Andre Tchelistcheff identifed the “big four” quality wine producers in the valley when he came to work here in 1938: Beaulieu (Tchelistcheff’s new employer), Beringer, Inglenook and … Larkmead. Larkmead? I knew the wines were very good, but I didn’t appreciate the historical significance. I needed to find out more. My curiosity was especially piqued because of what I knew about the other three wineries and the way that they fell into corporate hands and met different fates. Perhaps the saddest story (but with a happy ending) was Inglenook, which went from producing some of Napa’s best wines to being a lowly jug wine brand. Only recently, after years and years of effort, has Francis Ford Coppolla managed to bring the estate, its vineyards and the Inglenook brand back together to make excellent wines. Congratulations to him on this achievement. We tasted with Colin MacPhail and Sonny Thielbar and enjoyed the wines quite a lot. But what I liked even more was the sense of history. Although everything about Larkmead is up to date, there’s a very strong sense of of identity here. The people at Larkmead know what they are –the stewards of the land — and who they are, too. After talking, tasting and thinking a bit I realized that several generations of extreme wine people were necessary to preserve these vineyards and to sustain a particular vision of wine through all of Napa’s ups and downs. The Tocai vines that first caught my attention aren’t central to all this (as I secretly hoped), simply an unexpected reminder of how hard it can be for a vineyard and winery like this to stay true to itself. We visited Anne Amie Vineyards twice during our Willamette Valley expedition (I taught a class for the University of Pinot at the International Pinot Noir Celebration) — first to attend a casual food and wine reception and then again for a “magical mystery tour” seminar and luncheon. We’ve been to this place on many occasions, starting about 30 years ago when it was called Chateau Benoit (after the founding family). We liked the wines then, especially the sparkling wines as I recall, and it has been interesting to watch the place evolve as the region’s wine industry developed. Much has changed. We called it Chateau Benoit (pronounced Ben-OYT) when we first visited because that’s how the founders said it, but I understand it morphed into a French-inflected Chateau Ben-WAH later on. And it 1999 it became Anne Amie when Robert Pamplin bought the operation and named it after his two daughters. More than the name has changed — Pamplin has invested much energy into developing Anne Amie’s Pinot Noir program as you might expect in Oregon — but much has remained the same, including some of the original vineyards (which is where this story fits into today’s post). As we drove up the long road to the hilltop winery, we passed the original (1979) block of Muller Thurgau vines that produced the grapes that went into the wines we tasted on our very first visit. It has taken a good deal of persistence to maintain these vines because they have faced a lot of challenges. The first is economic — there’s not much of a market for Muller Thurgau here in the U.S. It might make economic sense to pull them out and put in a more marketable variety. And then there’s nature. The bottom of the hill gets pretty cold in the winter and these old vines sometimes suffer. And I think I remember that they’ve been hit with Phylloxera, but nursed along rather than grubbed up as you might expect. I like the wine that is produced from these grapes — crisp and clean — but more than that I appreciate the extreme perseverance that is behind it. This particular Muller Thurgau vineyard is singled out for special mention in Wine Grapes by Jancis Robinson, Julia Harding and Jose Vouillamoz and it is easy to see why. These three vineyards only scratch the surface of extreme winegrowing, but I hope they make the point that my anonymous correspondent suggested. If wine really is made in the vineyard as we all like to say then we ought to honor and celebrate wine growing as much as we do wine making. Here ‘s a toast to the growers! Cheers! Thanks to Barbara Glover and Wine Yakima Valley for inviting me to take part in their vineyard program. Special thanks to Hugh, Kathy and Kerry Sheils for answering all my questions and sharing their wine growing experiences with me. More thanks to Colin MacPhail and Sonny Thielbar at Larkmead and to Ksandek Podbielski at Anne Amie. Happy New Year to all! Photos: Old vine Tocai block at Larkmead, Hugh Sheils at DuBrul, those old 120 year old Tocai vines once again, and the view from Anne Amie looking down the hill at the Muller Thurgau block. Since I’m writing about South Africa’s Extreme Wines (see previous post) I cannot neglect a wine so extreme that it it took an act of Congress (figuratively) to get it produced, and act of Will (literally) to initiate a tradition that can be sustained only when acts of Nature permit, and that provoked the creation of a very special stage for extreme acts and actors. I’m talking about the wine in the photo, Nederburg Edelkeur, one of South Africa’s (and the world’s) treasured extreme wines. This is a personal story for me because my small cellar now holds two half-bottles of Edelkeur from the 1977 and 1979 vintages. They were given to me by Carina Gous, Distell Business Director of Wines, as a token of thanks for giving the keynote address this year at the Nederburg Auction. I’m looking forward to sharing these wines with Sue (and perhaps one or two special friends) on an appropriately special occasion several years in the future. Edelkeur was the personal vision of an extreme wine person, Günter Brözel, one of South Africa’s most honored winemakers who was Nederburg‘s cellar master for 33 years until his retirement in 1989. (You can see and hear Brözel in the video below. You can read details of Edelkeur’s history here and another story here). Brözel’s extreme idea was to create a Noble (made with Botrytis infected “noble rot” grapes) Late Harvest wine that would express the elegance and power of South African terroir in much the way that German Trockenbeerenauslese, French Sauternes and Hungarian Tokaji represent their respective wine producing regions. The only things that stood in his way were Mother Nature and the South African wine law. Mother Nature is easy enough to understand. Late harvest wines are tricky to produce because the grapes need to stay on the vines long after the usual harvest and they are subject to damage from birds, mold and other problems. Making a Noble wine is even harder and requires both luck (in the vineyard) and lots of harvest labor. You can’t count on making a noble late harvest wine every year and indeed the first Edelkeur vintage in 1969 was not followed by a second until 1972. So Edelkeur required an act of nature to make, but an act of Congress? Well, not literally Congress, but it’s a fact that South African wine laws prior to the 1969 vintage did specifically forbid this kind of wine. 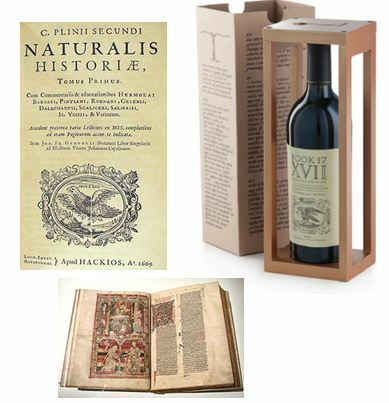 The rules permitted (and protected) sweet fortified wines but outlawed the production of natural (unfortified) wines with more than 30 percent residual sugar. Tokaji Eszencia often has as much as 50 percent to 70 percent residual sugar (90 percent in the 2000 vintage!). Brözel was going for an extreme and the law got in his way, so the law had to be changed. And it was. But not all the laws yielded to Nederburg’s cellar master. The most reliable way to get late harvest grapes (because Mother Nature’s part is reduced) is to harvest them earlier and dry them on racks, concentrating the flavor that way. (Just as the most reliable way to make Ice Wine is to pick unfrozen grapes and then … freeze them!) But Nature’s Law prevailed here and so the grapes for Edelkeur are left to hang exposed to and expressing wild nature before being finally picked and vinified. And so finally Brözel was able to make Nederburg Edelkeur but that created another problem: how to distribute the tiny amount of this precious wine that law and nature permit. After some early trial and error, it was decided that a special stage was needed and this became the now-famous Nederburg Auction, where a juried selection of rare South African wines are offered up once a year to the international wine trade. Some of the 1972 vintage was sold at the first Nederburg Auction in 1975 and the link between the auction, Edelkeur and the best of South African wine has been going ever since. The “first five” founding wineries — Nederburg, Delheim, Groot Constantia, Overgaauw and Simonsig — are now joined by many others, the Auction Selection wines determined through rigorous blind tasting panels. It’s an honor just to be selected for the auction and to have your bottles wear the “Nederburg Auction Selection” ribbon. The auction today does much more than just allocate one extreme wine. It honors an extreme wine person’s vision and draws international attention to South Africa’s best wines. So what does the wine taste like? Well, I’m not going to open my bottles for several years, but I was able to taste through several vintages of Edelkeur on the first day of the auction and they were memorable and gave a hint of how this wine can age. I don’t rate wines or write reviews, but I found this CellarTracker tasting note for the 1976 vintage that sums up my opinion. One of the people I was tasting with that day had this reaction: “They shouldn’t sell these wines; they should hold them back.” She didn’t care about the money, she just knew that the wines would get better and better and that it was a sin to drink wines like the 1979 and the 1977 so young. She’s right, I suppose, because certainly the wines will continue to develop for many years, but I think she’s wrong, too. Yes, the wines will get better with age, which is why I’m not rushing to pull these corks, but putting some of them up for auction isn’t really about the money or maybe even [just] about the wines themselves. There’s something bigger going on here — defining the identity of South Africa and its wine and honoring the passion of the wine makers — and that’s what makes it really extreme. Update November 1, 2012. Here’s a new video from the Nederburg Auction website. Cheers! Extreme Wine South Africa: Oldest Living Wine? I received many invitations to sniff, swirl and chat while I was in South Africa and I had to decline most of them because of my tight schedule. 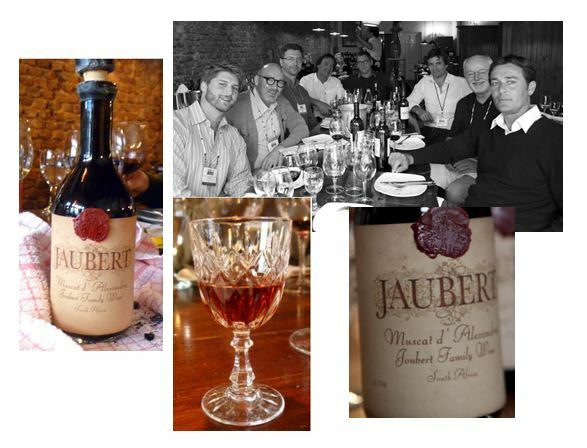 But I’m glad I made time for lunch with Cobus Joubert of Maison Joubert and his winemaking (and photo-taking) brothers. It was a most memorable Extreme Wine experience. The agenda for the tapas lunch was mainly to talk about wine and South Africa (and for me to autograph a copy of Wine Wars that Cobus brought along for that purpose). Cobus and his wine-maker brother Meyer opened several bottles of wine from the family wine farm, Joubert-Tradauw, which were excellent and paired well with the tasty food. But the simple tasting turned a bit competitive when another brother, Schalk-Willem Joubert, Cellarmaster at Rupert & Rothschild Vignerons, pulled out some of his wines for comparison. Joubert-Tradauw and Rupert & Rothschild represent two faces of South African wine that, like the brothers, compete in a friendly way. The Joubert family history in South Africa goes back ten generations to 1688 when French Huguenot Pierre Joubert arrived in Cape Town. The current Joubert-Tradauw wines date from 1982, when vines were planted in Klein Karoo, and 1997, when the cellar was established. Rupert & Rothschild, on the other hand, is a partnership between the Rupert family of South Africa and the late Baron Edmond de Rothschild. The Rupert family, whose wealth is measured in the billions, controls the Swiss luxury goods multinational Richemont (brands include Cartier, Alfred Dunhill, Van Cleef & Arpels, Piaget, Sulka, Montblanc, and Baume & Mercier) as well as South African wine and spirits producers such as La Motte Wine Estates. Baron Benjamin de Rothschild, who continues his father’s work in this project, is descended from the non-winemaking branch of the Rothschild family tree, but certainly the Rothschild name unlocks doors, for wine as other things, especially in the growing China market. The R&R wines have South African roots to be sure, but with high international aspirations. It was interesting to taste the brothers’ wines at lunch. Sometimes Meyer’s wine would shine a bit brighter, other times it was Schalk-Willem’s wine that stood out. The wines were deliciously different, but not without a certain family resemblance, just like the brothers themselves. Just twelve 250-ml bottles of this incredibly rare and ancient Muscat d’Alexandrie are released from a 100-litre French oak barrel in Klein Karoo that is topped up each year. It has an iridescent clear amber hue with green tints on the rim. The nose is simply stellar: candied orange peel, toffee, apricot and almond soar from the glass and fix you to the spot. The palate is perfectly balanced and fresher than some South African wines two centuries younger! It has a Sauternes-like viscosity but is not cloying like a Tokaji Essenzia. There is a touch of sherbet at the tip of the tongue and then it fans out towards a kaleidoscope of spice, clove, candied fruits and a touch of honey. One can discern an oxidative tang towards the finish that has a touch of volatility. Very long and intense and yet somehow refined and elegant, this is an ethereal experience. Drink now-2100+. Tasted June 2011. I missed the touch of sherbert, but the rest was there in my glass. Drink now or until 2100+. Now that’s a wine that can age. The brothers date the wine in their barrel from 1800 because that is the date that is given for the few similar lots of wine that are still around, but they think it could be older. The barrel has been in the family for several generations and in fact the house they grew up in was built around the barrel, so there is no way to get it out. They worried a bit (as brothers would about an ageing uncle) that the oak barrel was getting old and might some day simply collapse. But they had no plans to try to fix it up — too risky. They maintain the wine — and share it! — through a sort of solera practice where, as the tasting note above explains, three liters of the wine are drawn off each year, replaced with new wine and a little bit of spirits. Is it the “oldest living wine” in the world as some have said? That probably depends upon your point of view, but it is certainly the oldest wine that I have ever sampled. And one of the youngest and freshest, too, if you go by taste. One of my goals in visiting South Africa was to taste a wine as close as possible to the famous Vin de Constance that European heads of state treasured and Napoleon requested on his death bed. I did in fact get to taste a 2007 Klein Constantia Vin de Constance (made by Adam Mason, who was at the Joubert lunch) at a dinner party hosted by Mike Ratcliffe and it was great — hats off to Napoleon and special thanks to Mike and Adam. But the glass that Cobus put in my hand brought me as close as any human being can come to that 200 year old taste. The lunch group shown in the photo includes (left to right) John Mitchell, Chris Waters, Igor Ryjenkov MW, Schalk-Willem Joubert, Adam Mason (winemaker at Mulderbosch, ex of Klein Constantia), Cobus Joubert, Mike Veseth and Meyer Joubert. Photo by Andries Joubert. Thanks to Cobus and family for sharing this great experience with me.